Ice hockey made its first appearance at the 1920 Summer Olympics in Antwerp. Four years later, what is now known as the first Winter Olympics was held, and an ice hockey event was included. A women's ice hockey event was added to the Olympic program in Nagano 1998. It was also the first time the ice hockey competition was open to professionals. There is currently two gold medals up for grabs in ice hoceky - in men's and women's ice hockey. The first time Olympic Ice hockey was played was at the Summer Olympics in 1920, with Canada winning the gold medal and the United States second and Czechoslovakia third. Canada were undefeated in ice hockey for the first four Winter Olympic Games. Canada finally lost their first ice hockey match in 1936, with Great Britain winning the gold medal (though note that almost all of the British players lived in Canada). In St Moritz in 1948, the American Olympic Committee sent a hockey team, as did the American Hockey Association. As a consequence, the IOC barred both from being considered for a medal. In 1956 the Soviet Union (USSR) participated in its first ever Winter Olympics, and not only won the gold medal in ice hockey, but won the most medals of all countries. In Oslo in 1952, the Canadian ice hockey team won their seventh gold medal in eight Olympics - though it was fifty years before they won another. In Squaw Valley 1960, The U.S. ice hockey team won the gold for the first time, upsetting both the Canadian and Soviet teams. The Russian ice hockey team won its fourth straight gold medal at Innsbruck in 1976. In 1980 at Lake Placid, the USA ice hockey team pulled off an upset victory over the heavy favorites USSR in the match now called the 'Miracle on Ice'. In 1998, the ice hockey competition was open to professionals for the first time. The competition was won by the Czech Republic. Women also competed in ice hockey for the first time. In the inaugural women's ice-hockey tournament, United States defeated arch-rivals Canada 3-1 in the final. In 2002, the Canadian men's ice hockey team won the gold medal 50 years to the day after the last time they'd done so. The Canadian women's ice hockey team also won, with USA second in both cases. A member of the men's team, Jarome Iginia became the first black male gold medal winner at the Winter Olympics. 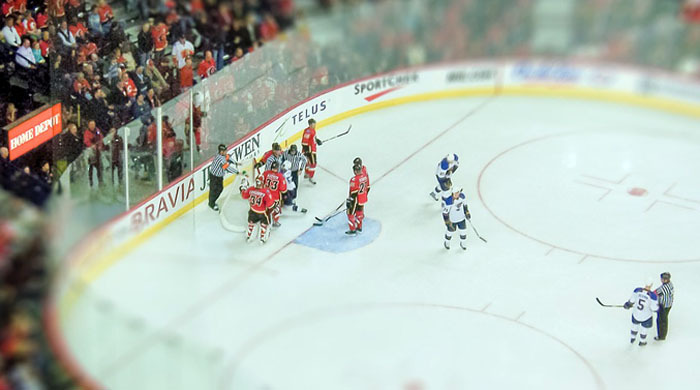 In Vancouver 2010, the men's and women's hockey was played on smaller (60 x 26 m vs 60 x 30) NHL-sized ice for the first time, saving the building a new rink. In 2014, The Canadian men became the first team to win back-to-back gold medals since the Soviet Union won gold at the 1984 and 1988 Olympic Winter Games. Iin the women's tournament, Canada needed overtime to win 3-2 and to give the team its fourth successive Olympic gold. In April 2017, the NHL announced that their players would not be available for the ice hockey tournament at the 2018 Winter Olympics. In the women's ice hockey tournament in PyeongChang 2018 there will be a combined Korean team made up of players from North and South Korea.